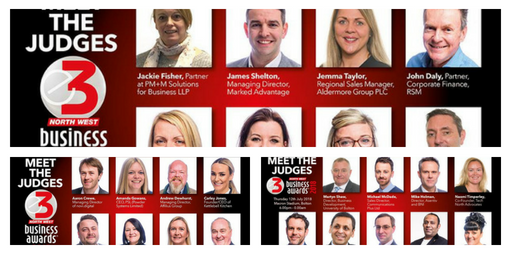 The judging panel for the 2018 E3 Business Awards has been named. The organiser, 1 Events Media has selected a total of twenty-four judges from the fields of business, education and business support. These include five chairs who will lead the panel sessions covering the eighteen award categories. The judges will apply their collective experience to assessing award nominations from companies, entrepreneurs and social enterprises across the North West. The judging process will entail an examination of written submissions followed by interviews with all shortlisted nominees. These will take place between 8th and 10th May 2018 at the Macdonald Kilhey Court Hotel in Wigan. The winners will be announced at the E3 Awards evening itself, which will take place on Thursday 12th July at the Macron Stadium in Bolton. Speaking on 6th March, at the end of a specially organised judges’ training day, 1EM managing director, Mubarak Chati said: “The judges will be looking for strongly-evidenced entries from all sorts of North West organisations and individuals – not just mainstream businesses. The E3 Business Awards celebrate diversity in all its forms, so we want to see plenty of representation on the part of women, young entrepreneurs, rural businesses, social enterprises and others. Nominations can be submitted by downloading entry forms. Thank you @BCTLtd for your nomination #CustomerServiceAward #E3Awards19, good luck! Thank you @RedSeaPed for your nomination #Charity #E3Awards19, good luck! Thank you @YPSolutions1 for your nomination #CreativeDigitalMedia #E3Awards19, good luck!